Stroke, also known as a cerebrovascular accident, or CVA, kills more than 130,000 Americans each year—that’s 1 out of every 20 deaths. Every 4 minutes, someone dies of stroke. Every year, more than 795,000 people in the US have a CVA. About 610,000 of these are first or new strokes. About 185,000 CVAs—nearly 1 of 4—are in people who have had a previous stroke. About 87% of all strokes are ischaemic strokes (blood flow to the brain is blocked). Stroke costs the US an estimated $33 billion each year. This total includes the cost of health care services, medicines to treat stroke, and missed days of work. CVA is the 5th leading cause of death for Americans, but the risk of having a CVA varies with race and ethnicity. Risk of having a first CVA is nearly twice as high for blacks as for whites, and blacks are more likely to die following a stroke than whites are. Hispanics’ risk for a CVA falls between that of whites and blacks. Stroke risk increases with age, but cerebrovascular accidents, or CVAs can—and do—occur at any age. Stroke survivors are at high risk for recurrent strokes. Most patients that have a stroke often have significant atherosclerotic lesions in their vascular system and are therefore have a higher risk of recurring strokes and heart disease, causing mortality. Coronary artery disease (CAD) and ischaemic stroke are often associated with high blood pressure, abnormal level of blood lipids and lipoproteins, smoking, lack of exercise, obesity and type II diabetes. Changes in medication and lifestyle are therefore crucial in the prevention of recurrent stroke and heart disease in CVA survivors. It is therefore very important that survivors implement post stroke exercises to recover physical ability as soon as possible, and as often as possible. Primary neurological disorders caused by CVA include hemiplegia (paralysis on one side), spasticity (arm and leg muscles cramp or spasm) and aphasia (making mistakes with words, sometimes using the wrong sounds in a word, choosing the wrong word, or putting words together incorrectly. These disorders cause activity limitations, making previous simple daily activities difficult, such as bathing, dressing or walking. CVA survivors will need to adapt, learn to cope and go through rehabilitation. Roughly 14% of CVA survivors achieve a full recovery in physical function, between 25%-50% require some daily-living assistance and half experience severe long-term effects, such as partial paralysis. The oxygen cost of walking or exercising in hemiplegics compared with able-bodied persons of similar weight. In some cases, the reduced mechanical efficiency and concomitant increased energy cost of walking can be up to double that of able-bodied persons. Because daily activities and exercise can be more tiring compared with able-bodied persons, CVA survivors can suffer an intolerance to exercise, causing reduced cardiovascular fitness, muscle atrophy, osteoporosis and impaired circulation in their lower extremities. This can lead to further complications of a thrombus formation, decubitus ulcers, or both. Mentally, adjusting to their new situation and dependence on others can have a deep psychological impact, such as deep depression. This in turn causes a lack of impetus to put in the hard work necessary to recover as far as possible, causing a vicious circle and spiral downward into overall ill health. Rehabilitation programs also concentrate on improving the patient’s quality of life, functional capacity and mobility (eg, increasing gait velocity), neurological impairment, and motor function (eg, lowering the energy cost of a hemiparetic gait). It is crucially important that the patient’s mental state is taken into account and not ignored, as this will have an overall impact on the best possible recovery possible. An obvious recommendation is to look at the risk factors that potentially caused the stroke, such as an unhealthy work/life balance, unhealthy diet, lack of exercise, smoking, genetic factors (such as high levels of cholesterol). Studies indicate that a major rehabilitation goal is to improve cardio-respiratory fitness. As mentioned above, the patient’s mental health must be taken into account at all times, as post-stroke depression is common and depression can lead to isolation and hence a lack of exercise leading to high risk factors for stroke recurrence and a vicious cycle. Since stroke rehabilitation exercises are crucial to the patient’s prognosis, the importance of a supervised rehabilitation programme cannot be emphasized enough. This is true of many chronic disorders. During this time period stroke survivors will be able to feel the benefits of daily exercise. They will understand the type of exercises that are beneficial to their specific physicality. It’s important that they understand how to implement them safely (technique) and for some, remove the fear or feeling of intimidation of going to the gym. 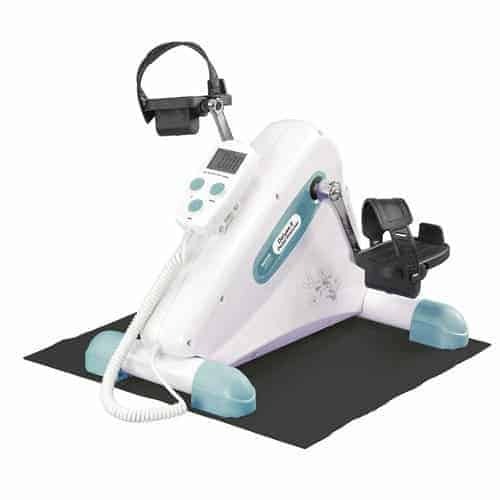 Aerobic exercise such as walking on a treadmill or cycling on active passive exercise bikes could also be implemented at the rehabilitation centre, at home, or at the gym. Stationary cycling training has been found to have a positive effect on dynamic balance as measured by using the TUG test*, most likely due to muscle strengthening. The effectiveness of cycling training in improving locomotor function is similar to the effectiveness of treadmill exercise in stroke patients. Cycling exercise improves gait abilities in chronic stroke patients because repetitive bilateral training and treadmill walking with or without suspension have a positive effect on walking ability. Because stationary cycling exercise employs reciprocal movement of the lower limbs and requires coordination of corresponding muscles, the gait ability is increased. *The Timed Up and Go test (TUG) is a simple test used to assess a person’s mobility and requires both static and dynamic balance. It measures the time that it takes a person to rise from a chair, walk three meters, turn around, walk back to the chair, and sit down. Improving overall fitness, stamina and strength are crucial. Patients will regain some, if not all, physical range of movement and capability. This will also improve mental health and prevent social isolation. If a stroke survivor is finding it difficult to deal with due to their mental state, such as depression, they will find it harder to exercise. Exercise will therefore improve their rehabilitation / recovery period. It is imperative that the patient’s mental state, as well as their physical state, is monitored. Where necessary, the patient should be referred for psychological therapy in order to improve their mental state, with positive repercussions for their physical state. The Effect of Electrical Passive Cycling on Spasticity in War Veterans with Spinal Cord Injury. Seyed Mansoor Rayegani,1,*Hadi Shojaee,2Leyla Sedighipour,1Mohammad Reza Soroush,2Mohammad Baghbani,2and Omm’ol Banin Amirani2 Front Neurol. 2011; 2: 39. Published online 2011 Jun 20.